I’ve finally got a few players together to do some playtesting of the SINS Draft. We ran through the Pilot Episode a few nights ago, and I’m already getting a lot of great feedback on things that need to be fixed, tweaked, or changed. It will probably be another day or two before any of those tweaks hit the PDFs, and maybe a lot longer after that before any of the more major changes show up. I admit, we are playing around with a minor-supernatural edge on one of the characters. While far less potent than an Arcane Background, it may prove a decent fit for Psychic Detective type characters. Actually this player’s character is playing up a more mystic background through Native American roots. 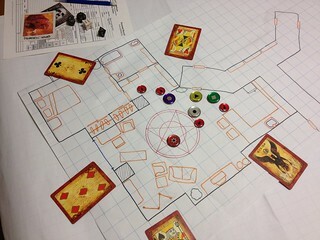 If you’re interested, the in the photo the players and monsters are being represented by tokens. I picked up a bunch of PennyGems a few months back and they are working great as player markers, monsters markers, Bennies, Departmental Favor Tokens, and even a way to track wounds. I highly recommend them. In the image, you can see the players and wildcard foes are tracked with various JumboGems, while the minor foes are represented with standard pennygems. The map itself might also look a bit familiar to avid TV watchers. It’s actually based on the layout of the Seinfeld apartment. I was shown this great website a while back, and it’s a wealthy of useful modern set layouts. The cards in this image are from Karnival’s “Inferno” deck. I’ve found that there are some really interesting 54 card decks out there, many designed for magicians, so if you look around a bit you can find a lot of interesting options for various game themes.